Originally from the UK, but I now live in the Pacific Northwest with my beautiful wife and children. I love to discuss life, the universe, and everything philosophical. I am constantly researching quantum physics theories and scientific breakthroughs, as well as theories of past philosophers. I am a huge video-game nerd, love superheroes, super-villains, robots and technology in fact and fiction. I love making contraptions out of junk. 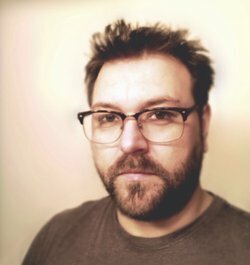 I am a fan of archery and ancient hunting techniques, although I don’t hunt (I am a vegetarian pacifist) I spend my time writing, painting, playing music, building things, reading, researching, and learning. I thrive and survive on new knowledge. I am a wide-eyed student of life. The final draft of my latest book, Harmonic, is in the hands of my beta readers. It is the first part in a series and a little different from my previous work. When and why did you begin writing?? I’ve always written, but only started taking it seriously when I hit thirty. I dream complete stories, often episodically over several nights. I’m mostly lucid in my dreams and can direct the dream as I wish. It’s always been that way, and I use that time to work through life’s conundrums. My subconscious mind works much more efficiently than my conscious mind. I love to dream. I’ve always had a problem with labels, artist, writer, musician, and for me I think that when other people start using those terms to describe you, then it’s safe for you to do the same. I was officially an author (published) before I considered myself a writer. What inspired you to write your first book?? My first published work was Skin Cage (2015), which was inspired by a dream. The idea of being trapped in one’s own body and relying entirely on others intrigued and terrified me. I chose to write it in first person and in present tense, with all of the limitations that would come with that perspective, and really enjoyed the challenge. This was not the first novel I wrote, and some of the stories I penned as early as thirteen still play occasionally in my dreams (some of which may end up as future publications, although rewritten from the core idea). Do you have a specific writing style?? I’ve been told that my style is distinctive and unique, but honestly I just write. I love language, I love words and how they go together to paint an image. My aim is to write sentences that not only tell the story, but evoke an emotional response. I am a fan of beautiful, rhythmic prose, but not at the expense of the story. I try to write beyond my capabilities, just outside of my comfort zone in an effort to improve with each piece I write, but only my readers can judge the success or failure of my efforts. The Peter Principle: Within an organized hierarchy, each member of the group will rise or be promoted based on performance, ending in a position beyond his or her capabilities. I am striving to attain that level of incompetence. 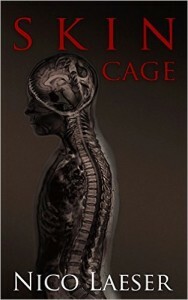 The premise of the book was a man trapped by his own body, a prisoner in his own skin. Skin Cage seemed to sum it up quite well. Skin Cage is essentially about love and hope. Being immersed in the story for the time spent writing it taught me to appreciate the small things, the ‘normal’ things, and the things I often take for granted within my own life. Hope is one of the most powerful tools for survival. The realistic, medical portions of the book were heavily researched, but there are elements within the story that are purely fictional, which I can’t explain without giving spoilers. Are experiences based on someone you know, or events in your own life?? 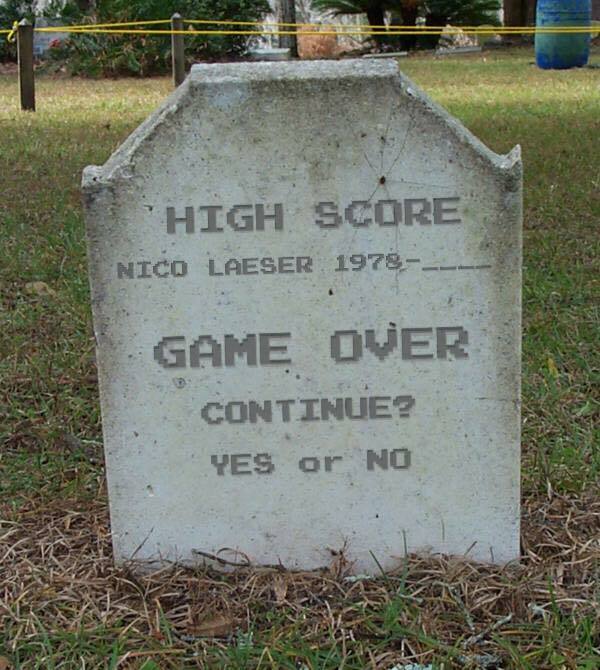 Thankfully no. I researched many cases of similar aware-unresponsive patients and some of their stories are truly heartbreaking and inspiring. Everything published between Flatland, and A song of Ice and Fire (and everything before and after) I read a lot, and I love a lot of what I read. I could answer the question a thousand different ways on any given day: Portis, Keyes, Palahniuk, Heinlein, McCarthy, Vonnegut, Burgess, Wells, Bradbury, A. Hempel, Attwood, H. Lee, Kafka, Picoult, King … if it’s made with words, I will probably enjoy it. I just finished ‘The Martian’ by Andy Weir which was a great read. I’m currently reading ‘The Experiencers’ by Val Tobin, and ‘The Goldfinch’ by Donna Tartt, and also a novel that is in beta stage. I’m enjoying all of them so far. Too many books, too little time. (I also dip in and out of none fiction, like The Singularity by Ray Kurzweil, between all kinds of literary and genre fiction. One benefit of man and machine amalgamation is that I will hopefully be able to download books straight into my brain/hard-drive and process them much faster). “I know every published fiction novel beginning with the letter A”—Future Nico_2.0 - day one of Skynet Library subscription service. Lesley Hayes has taken the top spot on my indie author shelf. I recently purchased her new novel ‘Dangerous people’ and can’t wait to start reading. Harmonic is with my beta team, and I’m writing a few short stories for various charity anthologies set for 2016 publication. I have a few more books in the works, that will hopefully see a release date in early 2016, one of which is reading like a dark comedy at the moment, but that may change with the mood of my menstrual muse. (Don’t tell her I said that, or some characters may not make past act 1). My friend, Thomas, who is also my primary beta reader, has been there since the beginning offering help and encouragement at every step of the way. 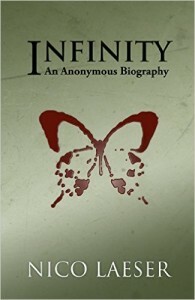 My novel ‘Infinity: An Anonymous Biography’ is dedicated to him. I could not ask for anyone more supportive, and if no one else was to ever read my work, I would continue to write in the hopes of entertaining him alone. I love writing, creating stories, and everything that goes into producing a book, but the marketing side of it bores me to tears. I would rather concentrate on the writing part, and when I have enough of a back-catalog I will take the business side a little more seriously. So, at the moment, I don’t see it as a career. I write every day, and I strive to create a professional product (Even the word product makes me cringe) and hopefully, one day, my children will see the rewards of my efforts. Until then, I will continue in my efforts to make art. Funny question. I did it all over again, and again, and again … My first drafts are terrible, my second drafts are slightly less terrible … eventually my drafts become tolerable, and then comes the real work of reworking them into a close approximation of what I had first envisioned. It takes a lot of sandpaper to make my prose somewhat smooth. My name is Emily. I am twenty-three years old, and I will probably not make it to twenty-four. I don’t know what I’m hoping to achieve with this recording, if anything, but I have no one left to talk to, so you’ll have to do. I paint all of my covers. I was a commercial artist for many years and still take on commissions if they are worth my time, or time that could be spent with my family. Art, music, and literature are my most efficient forms of communication, if only the for the communication of ideas from a cluttered mind to paper. Human language originates from sound and pictures; language is art and music. My final drafts are a challenge. I become increasingly hard to please as my work nears completion, or the peak of my capability. On my last pass before edits, I hit enter twice after every period, and work through each and every sentence in the novel, trying to refine or rework it to make it better. Quality is subjective to a degree though; the only thing I can do is make the sentence work for me, and hope I’m not alone in my taste. I learn something new from everything I write, whether from external research, or introspection. Exploring the darker aspects of your personality for certain characters can be cathartic, and I’m sure that many authors work through experiences from their past in their work. It’s free therapy, and it works. If you are having a bad day and it seems like everything you’re writing is garbage, just power through it. Keep writing. I think that every writer has those days. Sometimes you just have to clean out the old pipes—open the tap and let the water run, eventually the water will run clear, and will be palatable. (Joking aside) Thank you for taking the time to read my work. A novel requires the imagination of the reader as much as the imagination of the author. I hope you enjoyed our team effort. A book is only as good as the collaboration of the writer and reader. I write the screenplay, you direct the movie. If you enjoyed it, it is in-part down to the effort that you put in as a reader. Your efforts earn you a plaque: ‘Employee of the month.’ Well done). What makes you laugh/ cry? I love dry wit, dark comedy, and intelligent comedy. I try to avoid things that would make me cry, although there have been a few novels that have made me glad I wear sunglasses in public. ‘My Sister’s Keeper’ had a few throat-lump moments, and Disney/Pixar have the emotional roller-coaster formula down to a science (Daddy often has to feign ‘something-in-eye’ measures). Just one? Nikola Tesla. The man was incredible and should have been given the keys to this planet. I believe that he would have made the world a better place for all if given the resources and opportunity. When science is no longer driven by commercial viability, our species will thrive and evolve. 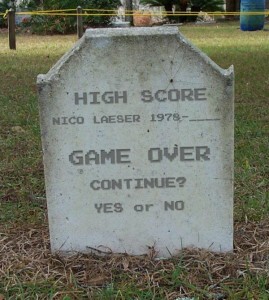 Because I’m a video-game nerd, who loves ambiguity and subtext. I love to paint, play piano, guitar, and any other instrument I can get my hands on. I am also an avid archer (target shooting only). My favorite recent TV shows were/are Breaking Bad, and Game of Thrones. We have two young children so we don’t get to the theater very often, other than for the release of new Disney/Pixar movies, which I love—When the kids are sleeping, my wife and I watch a lot of Independent movies, and foreign horror movies. Two of my favorites: Martyr, and Moon. Favorite foods / Colors / Music? Pineapple/Red/Everything from Classical to Metal that is written from the heart or soul. Sleep more. I am happy with my choices, I just wish that there was more time in each day. You can find me on Facebook and Twitter. My books are available through Amazon using the links above. I enjoyed reading this interview with Nico. It’s so nice to see what makes such a great writer tick. I’ve not read ‘Skin Cage,’ yet, but I’m sure it’s as piercing as Nico’s other books and stories that have a way of affecting people. I had the opportunity to read Harmonic as a beta reader, and that too should be put on everyone’s TBR list. Thank you Julia Lund and Sylva Fae for your wonderful comments. I read ‘Infinity’ a short time ago by Nico and was impressed with the depth of the characters. I’m looking forward to his new novel, ‘Harmonic’. It sounds intriguing. I really enjoyed reading this interview. Both Nico’s work, and Lesley Hayes are on my reading list. Can’t wait to get to them. I enjoyed reading this interview. For one so talented, you are very humble. Nico, you once said you aspire to be like Lesley Hayes when you grow up, well I aspire to be like you when I grow up. As one of your loyal fans, I’m super excited about your next book coming out, I know it will be just as amazing as your other books.